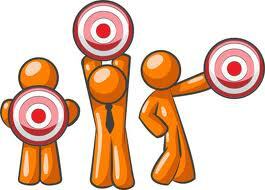 The PR Lawyer: Is Your Communications Plan Hitting The Target? With the 2011 getting underway, I have been reading a lot of articles regarding PR/Marketing trends to watch out for throughout this year. Many people are foreseeing increased usage of tablet computers like the IPad, growth of mobile marketing and coupon programs like Groupon. Today's PRSA ComPRhension blog article, Strategic Communication – Ready, Aim, Fire Or Fire, Fire Fire by Peter Hollister, reminded me of the importance of strategy behind any communications plan. With trends, coming and going, effective public relations needs to be conducted within the scope of a plan. Sometimes the urge to jump on the latest trend, results in a "we have to do this, right now" mentality or "Fire, Fire, Fire" mode as Hollister explains. With a haphazard way of engaging in public relations, how will results be measured? How will you know what works and what doesn't work? Most importantly, how did this campaign effect Return on Investment (ROI)? In a well-rounded, strategic plan, these questions can and will be answered. Communicators need to help bring the team back to a “Ready, Aim, Fire” mode by conducting the planning/research and identifying goals, objectives, key audiences and messages. Ultimately, trends can be here one day and gone the next, but strategic planning will always be a key component in a successful communications campaign.